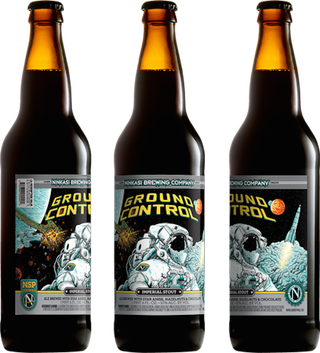 Beginning April 13, you'll have a chance to try Ninkasi Brewing Company's "Ground Control," an imperial stout brewed with yeast that, last year, traveled to space. ...In July, 2014, Mission One of NSP took flight as a rocket launched by the Civilian Space eXploration Team (CSXT) and Team Hybriddyne made its way to space, carrying 16 vials of brewer's yeast. Due to unforeseen circumstances, the payload of yeast remained lost on the desert floor of Nevada's Black Rock Desert for 27 days, leaving the yeast not viable for brewing. In October, 2014, a second opportunity presented itself for Mission Two with private spaceflight corporation, UP Aerospace Inc.. This time, six vials of brewer's yeast traveled 77.3 miles in altitude aboard a rocket, and returned safely to Earth. The result: healthy, hungry and viable yeast, ready for brewing. The yeast was cold-transported back to Ninkasi's lab in Eugene, where it was propagated and tested before being used to ferment its first beer, Ground Control. By all appearances, this beer will taste like an imperial stout brewed with any old batch of earthbound yeast. But if you're into living vicariously through the adventures of a microscopic fungus, more power to you, I guess. More info available at Ninkasi Brewing Co.